A Liberal's Libretto: Metropolitan Opera Guild presents: The Singers’ Studio. Metropolitan Opera Guild presents: The Singers’ Studio. Hear what opera stars of past, present, and future have to say about their work through this new series, produced in collaboration with OPERA NEWS magazine and the Metropolitan Opera Guild’s Public Programs department. 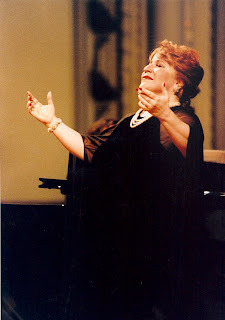 On Monday, May 03, 2010 6:00 PM – 7:15 PM, The Singers' Studio welcomes the other Divine Miss M ... Aprile Millo to a conversation with Paul Gruber. She will speak about her extensive career and her current activities. This event will be held in the Metropolitan Opera Guild Opera Learning Center on the 6th floor of the Samuel B. & David Rose building at Lincoln Center. For more information, check out the Met Opera Guild's website.